$14.99 $13.00 / month Save Money and Sign Up! In today’s world we like to process things. And processing can have many benefits, but some still prefer to use items in their raw state. 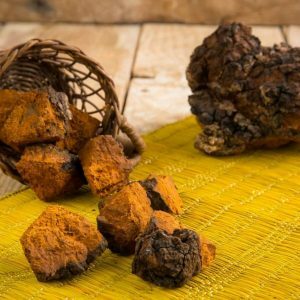 When it comes to chaga, cultures have been using it for health and wellness purposes for centuries. The chaga mushroom is found in northern climates including Siberia and Canada. The cultures there have been using chaga in a variety of ways for many years. We know that several hundred years ago that people have some ability to process and perhaps more than we give them credit for, but they likely used chaga and other natural herbs and mushrooms in a raw state. Today, people often look to past cultures for inspiration when it comes to health and wellness. And that inspiration often leads to using items like chaga in the raw form. Raw chaga is the purest way to obtain chaga other than picking it straight off the birch tree in Siberia and Canada. Some people prefer this type of chaga because they can process it to the consistency they like for however they’re going to use it. And, because raw chaga requires less processing from the selling company, it should be a lower price for the consumer looking to save while still getting the benefits of chaga. We should mention that our proprietary method for preparing raw chaga mushroom eliminates any bitterness in the end product. Raw chaga comes in two main forms: chunks and powder. The chaga that comes in chunk form is very pure and very similar to the consistency one would find in a natural setting. It can be broken down further into smaller pieces or into a powder or it can be left as the larger pieces for brewing. And the powder is commonly used as an additive to drinks like hot water or mixed in with food like yogurts and other items with similar consistency. Why Should I Use Chaga? As we’ve been discussing, you can really use raw chaga in a variety of ways. We’re always surprised at the ingenuity people have when it comes to using raw chaga. The raw chaga offers you the freedom to create your own health super foods and drinks. We like to recommend using chaga in teas and smoothies, but with raw chaga there are many options. * These statements have not been evaluated by the FDA. This product does not intend to diagnose, treat, cure, or prevent any diseases. CHAGA MUSHROOM PRODUCTS COME IN MANY FORMS! Many customers have asked us about the differences between raw chaga and chaga extract. We should start by saying that raw chaga should not be consumed. 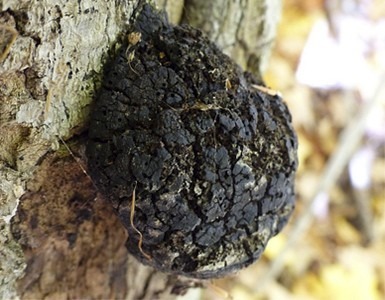 Chaga, like most other mushrooms, cannot be digested by the human body in its raw form. The mycochitin composition of mushroom cell walls, as opposed to cellulose walls of plant cells, is difficult for humans to digest. Our stomachs resent indigestible items, and often forcibly reject them without absorbing any nutrients. The brewing process helps break down fungal cell walls, rendering the mushroom flesh not only more readily digestible, but also releasing significant nutritional value contained within the cells. So, in order to get any health benefits from raw chaga, it needs to be brewed, or you could also consume water soluble chaga extract powder. Today chaga mushroom is available in many forms: teas, extracts, raw powder or chunks,capsules, creams and liquid. Many manufacturers offer dietary supplements which contain other components and additives, but only a small percentage of chaga. At Sayan, we believe that only pure, wild harvested forms of chaga are most beneficial to health, thus we offer our customers the most pure and potent Siberian chaga extract and raw chaga products. Our dietary supplements and teas are produced with no additives, preservatives, flavor enhancers, or coloring agents. All our products are caffeine-free and suitable for vegans and vegetarians. 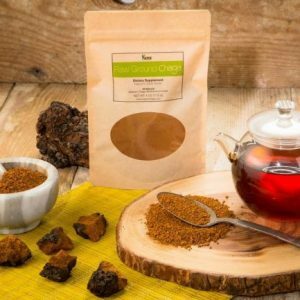 Raw chaga chunks/pieces and powder – Raw chaga is a dried, shredded, and purified form of chaga, available in chunks or powder. Raw chaga is not water soluble, and you need to brew it to enjoy its health benefits. Chaga extract – Sayan chaga extract is a concentrated extract of biologically active substances from chaga. Our chaga extract is produced via a low temperature water extraction, followed by a freeze drying process. Avoiding high heat treatment preserves the potency of the active ingredients present in chaga. Finally, chaga extract can be easily dissolved in any liquid and does not need to be brewed. 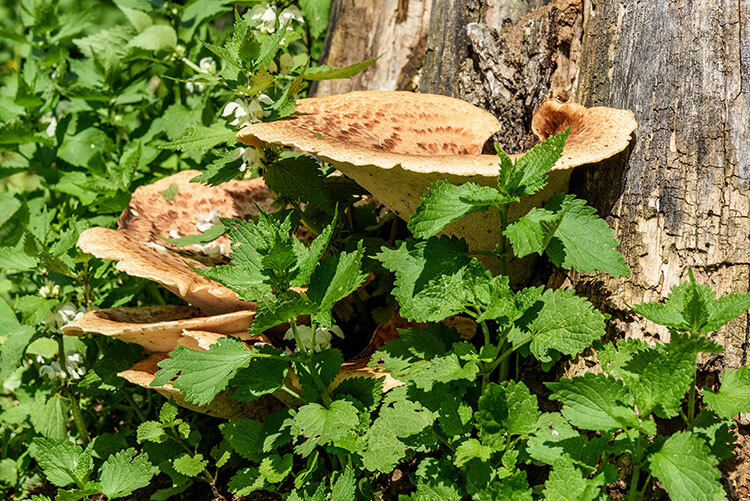 Sayan offers an extract of biologically active substances from chaga mushroom which contains a much higher concentration of active ingredients than raw ground chaga. Our extraction rate is 16%, so ration is about 6:1. Sayan is proud to offer our own custom tea blend – a combination of raw chaga and chaga extract, bringing together these ingredients in one convenient package. Conventional chaga tea is made of raw chaga only, whereas our Sayan tea also contains a chaga extract, thus allowing our customers to get the most benefits from this powerful combination. We offer the most potent, premium quality, all-natural, wild-harvested chaga tea on the market! WHICH IS MOST BENEFICIAL TO YOUR HEALTH: RAW CHAGA, CHAGA EXTRACT, OR CHAGA TEA? Chaga products complement each other well. Our chaga tea has an overall health-boosting effect, assuming it is prepared properly and consumed regularly over a period of time. However, the concentration of the active ingredients in chaga tea is not as high as in chaga extract, so for those seeking the maximum health benefits from chaga mushroom, chaga extract is the best choice. The potent dietary chaga supplement is the highly concentrated extract powder, which contains biologically active chaga substances in large quantities. The concentration of antioxidants in chaga extract is very high, thus regular use of the extract can support health in numerous ways. We also offer chaga extract powder which in enriched with 5% betulin, which make is the most potent product in Sayan dietary supplement line. Chaga extract is the top choice for those who want to get the maximum benefits from chaga. Drying chaga extract in infrared and thermal spray driers requires the application of heat, which negatively impacts the effectiveness of the product. Note that during heat drying (infrared or spray), chaga extract is often overcooked, which increases the ash content and unpleasant odor of the finished product, and destroys the natural nutrients. There is a common misconception among chaga consumers that chaga extract of a dark brown color signifies a quality product. Of course, the dark color of the extract indicates high quality, however, you must be careful, since the heat-drying method can burn the extract and also result in an unnatural dark brown color. This is atypical for extracts produced by freeze drying process. How can you distinguish chaga extract produced by freeze drying from its counterpart dried the thermal spray method? As seen in the photograph to the right, the external difference is obvious: The picture of the right shows two types of chaga extract. Click on the picture to enlarge it. The extract on top – brown in color, shows chaga extract dried via thermal spray. 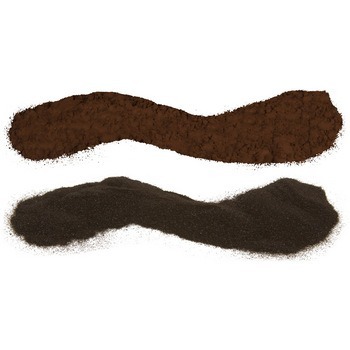 This extract is not burnt – in fact, it has the natural color of the extract when dried in this manner. The extract on the bottom – chaga extract dried via freeze drying. This extract is darker, and never overcooked. Although both are water-soluble extracts, chaga extract produced via freeze drying is dissolved in water of any temperature instantly and completely, while the other extract has a flour-like consistency, floats on the surface of a liquid and will dissolve only after mixing, forming a precipitate. The technology for producing our extract includes extraction of bioactive substances from chaga by evaporating hot water in a vacuum, followed by freeze drying (sublimation), a gentle drying process that preserves the beneficial active ingredients in chaga. In contrast to other drying processes, freeze drying preserves the consistency, color, shape, and potent flavor of the original product. Because the product is warmed only slightly, the vitamins and minerals are preserved as much as possible. Within seconds, freeze-dried ingredients rehydrate and are restored to their original, freshly harvested condition. Contact with water restores their original color, aroma, and flavor. Chaga extract produced by Sayan using freeze drying technology offers many advantages over chaga extract obtained by heat drying. We are the only manufacturer of chaga products that use this technology, as heat drying is the most conventional technique used in the chaga industry. Heat drying involves the use of high temperatures, which undoubtedly leads to partial damage of the molecules of chaga’s biological substances, and a reduction in effectiveness. Chaga extract produced using our method has a pleasant aroma and a pronounced taste. 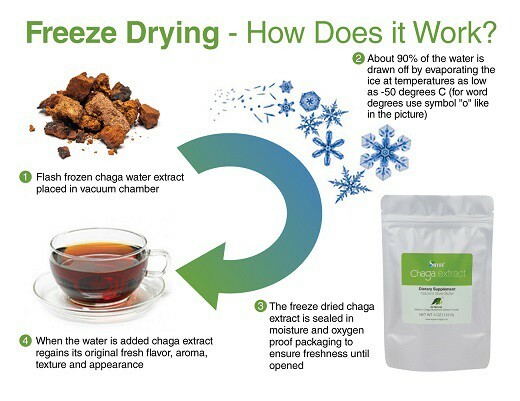 Freeze-dried chaga extract can be stored over a long period of time without losing its beneficial properties. Careful release of the liquid form of chaga extract from the ballast and insoluble particles prior to drying allows us to produce a dry chaga extract with high solubility; using such an extract as a dietary supplement is much easier and much more pleasant. Only our extraction process yields a dry chaga extract with an acceptable level of moisture. Products that have been freeze dried retain their organoleptic properties, are readily soluble, weigh very little, and have a long shelf life. All their vitamins are preserved, proteins are hardly denaturized at all, and thus their nutritional value is retained. If you have questions about the differences between raw chaga and chaga extract, please e-mail or call us, we are always happy to talk to our customers! Wondering, is dried chaga good? Many are happy to cut the raw chaga from its birch tree host and brew it, right on the spot. In fact, traditionally we know chaga for its dried composition. As a result, the dried form of chaga offers users the convenience of a packaged and processed product. Hence, the best type of consumable chaga happens well after harvesting and processing. Chaga arrives in many helpful products available today. The rough exterior of the chaga is deceiving and textured more like an adverse growth, than that of a nutritional powerhouse. This mushroom is not as dry as it looks. Clean your newfound supplement of all debris and tree dirt. Also, you can use this kind of outcast for your compost or as a fertilizer for other plant growth. For the best results, refrigerate chaga. Ideally, chaga dries as soon as possible. Making a dried chaga takes patience and overnight dehydration in an oven. Thus, it relieves you of time constraints that room temperature drying impose. For best results, dehydrate chaga in a 50 to 75-degree oven. This renders the product is best for future use as a more healthy product. From here, ground the chaga into powder for use as a tea. However, many products benefit from the chaga infusion. Suppliers of this herb are innovative and make differing products with chaga as the main ingredient. From oils and convenient capsules. 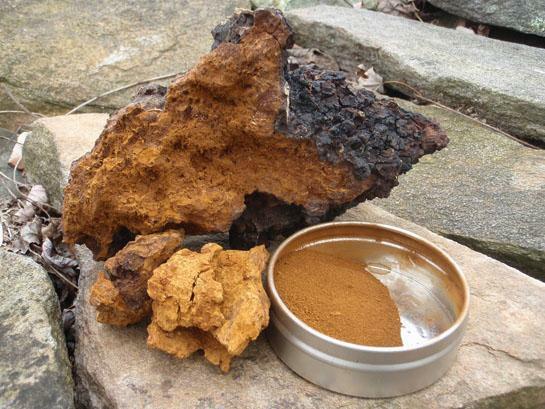 To topical based skin care, as can be seen,chaga now has many everyday uses. If you are an aspiring chaga hunter, remember to not get from the forest floor. The second most important thing to remember is that chaga is at its best when it is older. Harvesting the younger chaga means the nutritional benefits have not fully matured. Treat newly separated chaga in a certain way to keep its usefulness as a health supplement product. Particularly relevant are the middle and outer sections of the growth. The outer, crumblier parts hold no nutritional value at all. It would take years. For this King of herbs to become one of the most precious forms of medicinal mushroom on the earth today. Ongoing care and respect results in continued production in chaga’s natural environments. On the first inspection, chaga evokes many opinions. Due to this parasitic hitchhiker being a nutritional wonder. As a result, this medicinal mushroom is the topic of many conversations. Whatever your opinion. It's not best to overlook Chaga's benefits of its array of nutritious and sophisticated gifts. It is a naturally occurring product probably rich in history. And it holds continued importance for dietary and complementary health. For more on this Diamond of the Forest, research articles and discussions on how chaga may be right for you. Most noteworthy are the articles on the benefits of chaga for ongoing health. Finally, chaga is good for your body and your spirit. From soothing tea to products and to make you feel good all over, there are now chaga solutions for all. Maybe, you will find the best for you. For the uninitiated, chaga lives in the colder regions of Russia, Korea, Northern Europe and some parts of the United States and Canada. If you have the skills and expertise to hunt your own chaga, you may have some success. For those discovering chaga in their adventures, the temptation to eat it in a raw form may be tempting. Consumers of this diamond of the forest may want to, but can we eat raw chaga mushroom? Considered raw when straight of its host birch tree. Resembling a piece of charred wood, rather than a medicinal herb, chaga in its natural state seems unappealing. However, its rough texture and foreboding parasitic nature hides its real worth. The true benefit lies inside. Harvested by professional hunters, chaga contains natural health giving elements. Did you know chaga is one of the most revered ancient healers found today. Can You Eat Raw Chaga Mushroom? Fortunately, chaga's health benefits are not limited to teas. The inherent properties in chaga hold their own when combined to produce effective skin care.Use chaga inside and out. Include chaga lotions and soaps into a daily regime for greater personal care. Protectors such as antioxidants are particularly good for topical applications. Do you have itchy, red and irritated skin? It may be the products you have been using for years. Substitute regularly bought commercial, perfume laden irritants with a more natural product such as chaga oil. Furthermore, add some chaga tea to your bath water for a natural alternative to gritty bath salts. Your body will begin to feel the difference. From beginnings as parasitic growth of the birch tree, chaga is a superior assistance to everyday health and well being. With popularity growing in recent years, chaga is of past and present medicinal benefit.